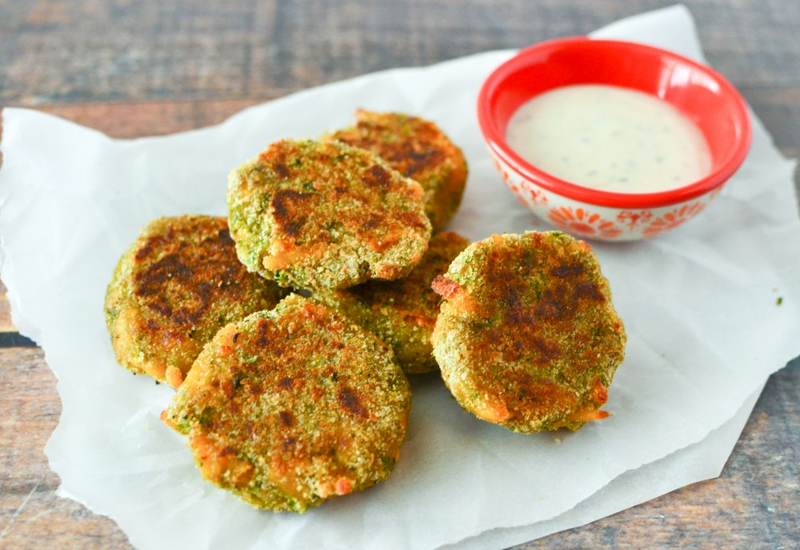 Whether you're vegetarian or just want to eat like one sometimes, you're going to love this recipe for veggie chicken nuggets. These broccoli-Cheddar nuggets are very kid-friendly—can you think of a better way for little ones to eat broccoli? This dish will also appeal to grown-ups. This recipe is ready to eat in less than 30 minutes so it's perfect for a quick lunch, dinner, or a snack. Best of all, you probably have most of the ingredients on hand to make this dish. Part of the fun of eating these nuggets is dipping them in sauce. Try them with ranch, barbecue, or sweet and sour sauce. Or serve them with your favorite sauce. Per Serving: 432 calories; 28g fat; 21.8g carbohydrates; 23g protein; 106mg cholesterol; 699mg sodium. I was surprised by these broccoli cheddar nuggets. They're actually really good. My kids love dipping them in ketchup, they put it on everything! I don't mind it, so long as they get their vegetables. These broccoli and cheddar nuggets are addicting! I made them for my niece and nephew, but after trying one I couldn't stop! They were super cheesy and easy to make. If you like broccoli and cheese, you'll love this! Perfect for the little ones, and good enough for the adults too! They look and taste like nuggies, but they're... healthy? These were good, but they were a little crumby. I think it would have tasted better if it was chicken, broccoli, and cheddar nuggets. My kids also thought they were good, but not great. We also used Italian-style bread crumbs, so if I make these again I would use regular bread crumbs and probably add meat. The only thing I changed in this recipe was I added salt and pepper. It's hard not to snack while you're cooking, these are so yummy! If I could find a way to make this recipe egg-free I would give it five stars. The nuggets were really delicious, easy to make, and kid friendly. I used homemade bread crumbs too. These were absolutely amazing I’ve made them 3 times now, and they’re really good cold as left overs too!